Himachal Pradesh's snow-fed rivers offer tremendous opportunities for the challenging sport of rafting. The rivers Chandrabhaga (Chenab) in Lahaul, the Satluj near Shimla, the Ravi near Chamba and the Beas near Kullu offer immense whitewater rafting possibilities. 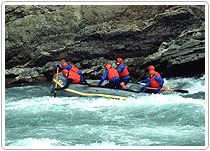 There are tremendous river running expedition oppurtunities between Shamshi and Aut on the Beas . The 20-km stretch has exciting and extreme whitewater rapids.